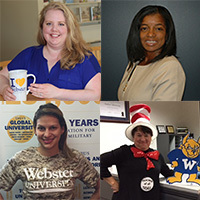 Through the Gorlok Greats Program, the Webster Staff Alliance recognizes outstanding staff members whose achievements relate to Webster University strategies and support the University's values and mission. This fall, we received over 30 nominations for this distinguished award, and a dedicated committee selected six exceptional employees from across the Webster Network. Elizabeth Fiock, Online Learning Center, was nominated in recognition of valuable contributions to the University’s mission, values, and goals. Cheryl Kennedy, Scott Air Force Base, was nominated in recognition of team effort and peer collaboration. Maria Martin, Bolling Air Force Base, was nominated in recognition of consistently providing high quality, reliable, and critical work that, if undone, would halt highly visible operations. Sunantha Namuangrak, Webster University Thailand, was nominated in recognition of positively influencing others in working toward departmental or organizational objectives. Dan Perkins, Webster Groves campus, was nominated in recognition of consistently providing high quality, reliable, and critical work that, if undone, would halt highly visible operations. Cammie Willis, Kansas City metropolitan campus, was nominated in recognition of developing innovative solutions to business challenges. The WSA also wants to recognize all our nominees from this fall. Although they were not selected as winners this round, it’s clear we have some truly GREAT staff members at Webster University! Nominees included Sheila Anglin Jordan, Carmen Carr, Citlali Cosic, Hal Deuser, Ted Hoef, Jennifer Hylton-Whited, Virginia Johnson, Pamela Lewis, Tanya Seale, Marilynn Shelton, Samantha Simmons, Thanh Dinh-Trang, Becky Wheeler, Kelly Young and Michael Zakibe. The WSA will be sharing more about each individual’s achievements through the WSA list serve and the WSA Facebook page. To learn more about the Gorlok Greats Program, please visit WSA’s webpage: webster.edu/wsa/gorlokgreatsprogram. Nominations for spring will be open Jan.15-March 1, 2018.